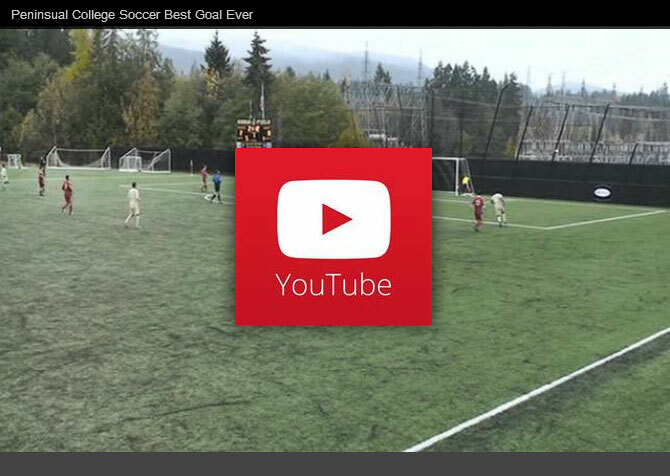 Even for die-hard soccer fans, the college soccer career of Miguel Gonzalez is mind blowing. He has set records that few will be able to match, both at Peninsula College and now at Seattle University, where he is currently a student on a soccer scholarship. As a Peninsula College Pirate, Miguel set single-season and career scoring records, collecting 34 goals during the 2011 season and finishing his two-year career with 49 goals. He was named NWAACC West Division MVP in both 2010 and 2011. Now, at Seattle University, Miguel is continuing to rack up the honors. In 2013, he was named to the College Soccer News National Team of the Week for the week of November 18-24, to the WAC All-Tournament team, as WAC Offensive Player of the Year and First Team All-Conference, and also named WAC Offensive Player of the Week for the week of October 14-20. 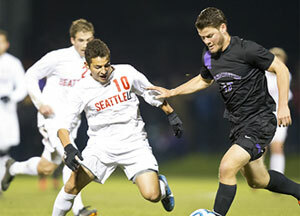 In 2012, in his debut year as a Seattle University player, Miguel played in 17 matches, scored four goals, provided one assist and tallied 50 shots with 13 of them on goal. Photo credit: Miguel at the NCAA Tournament this past season, playing against the University of Washington in the Second Round of the NCAA Tournament. Photo by Eric Badeau. For most, success like this on the field would be enough, but not for Miguel. Scholastically, he is also in top form. At Peninsula College, he maintained a 3.7 GPA, and at Seattle University he has more than a 3.0 GPA as a liberal studies major, which he plans to complete this spring. And then? Many feel a draft by the pros is more than likely in his future, and Miguel, himself, hopes to play professional soccer. But how did such a storied soccer and college career actually start? The beginnings go all the way back to when Miguel was just a young boy. An immigrant from the state of Michoacan in southwest Mexico, Miguel moved to the Pacific Northwest with three brothers, two sisters and his mother when he was eight. The family settled in Yelm, and it was there that his interest in soccer really took root. “Soccer is big in the Mexican culture,” he says. “I grew up watching it on TV almost every weekend, just dreaming of one day being one of those players I saw on television.” That and watching his older brother’s play clinched it for Miguel. “I just loved playing the sport. It was fun and exciting, and I got to meet great people. I was also pretty good at it,” he says. Miguel’s soccer talents quickly became apparent when he entered Yelm High School, where he was a four-year starter for the Tornadoes. A two-time First Team All-State selection, he helped the varsity team reach the district playoffs in 2007, 2009, and 2010. In 2008, he was named sophomore athlete of the year, and received the team’s most inspirational award in 2009. With the E. John and Helen Maier President’s Scholarship in hand, Miguel was able to finish his degree at Peninsula College and realize that he could be both an athlete and a scholar. PC Economics Professor Dr. Daniel Underwood is one of the professors who believed in Miguel and knew he could make it in the classroom as well as the soccer field. “While Miguel was known to the college community as an outstanding athlete on the field, I knew him as an outstanding student in the classroom. He was attentive in class, always prepared, and exhibited an enthusiasm for learning. I will always remember Miguel as living testament to what we should all aspire to in life, and that is excellence in all its dimensions,” Underwood says. Rick Ross, Director of Athletics and Student Services at Peninsula College, was one of those: “Miguel is one of the most exciting athletes we’ve ever had, in any sport. He is so skilled, and so explosive. He made big things happen in big games and helped us win a championship. He went on to be a star at the NCAA Division I level as well, and I fully expect Miguel to have a professional soccer career. Want to be a Pirate? If you're interested in Athletics at Peninsula College, contact Athletic Director Rick Ross at (360) 417-6533 or rross@pencol.edu, or learn more at http://athletics.pencol.edu.